String Quartet or String Trio? Which Is Best For Your Event? Home » News & Tips » String Quartet or String Trio? Which Is Best For Your Event? How much space is there for a string quartet? If space is very tight for your event, a trio will take less room obviously, but the difference is not huge. Sometimes clients say to us that they’re worried a string quartet will drown out their guests talking as they’re having a smaller event. The truth is that it’s highly unlikely an acoustic string quartet could ever drown out anyone’s event. Should the event be a more quiet one in terms of conversation, then the professional event musicians will most likely notice this and play more softly. But that in itself is very rare. Usually it’s a great volume for background music and then it doesn’t matter if it’s a quartet or trio – neither will have the effect of interrupting people chatting or force them to have to raise their voices. How important is music to your event? Do you want more variety and lots of well known and modern tunes? If you do, then it’s very much worth considering that you’ll be better off hiring a string quartet than a trio. There are not as many great arrangements of music for trio than quartet. In fact, pretty much all the best arrangements are made for quartet. Whilst it’s true that some of them sound absolutely fine when you drop one instrument, as you still get a tune, bass and middle line, many don’t sound as good and lots are not worth playing as they simply won’t be as catchy or effective. Good string quartet arrangements make sure all four instruments are working towards the whole and so losing one is losing something great. Trio arrangements, however good, can rarely get that full and exciting sound that a quartet can. Having said that, if for example you’re having a corporate reception or drinks reception, you may not mind this as you’re really just looking for the effect of live music. Or if you only want classical music for around an hour, then trio should be absolutely fine. What is your event? Continuing from the last point, if your event is a wedding and therefore a hugely important and personal day, we’d recommend quartet over trio in almost all cases. 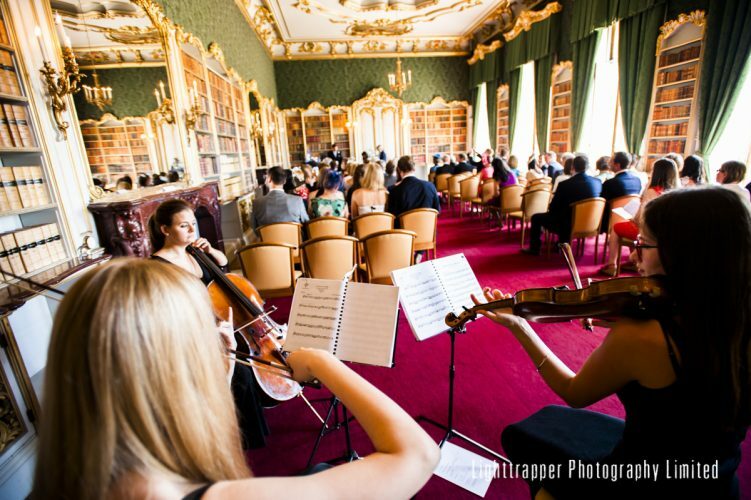 Whilst we get great feedback for both, all of our best testimonials after weddings are for string quartet. It’s simply more fun and impressive sounding. To play complete and elegant arrangements of popular songs that people recognise is something that is much more likely to get your guests commenting on how much they enjoyed the music. A trio can achieve this, but is much less likely to. For the sake of the cost of one additional performer, to us quartet would be the clear choice. For corporate events and private parties, it’s less clear cut. You’d be better off asking us about this on a bespoke basis. We’ve found that sometimes events companies and party planners book us for their clients – especially corporate ones – and they are quite certain from the start that trio is what they want. For those often shorter bookings of around an hour, we agree that trio is absolutely fine. However, we recently did an event for ASOS/Adidas and it was very much the case that string quartet was more suited as they wanted a set of famous pop tunes for an hour and trio would not have delivered this nearly as well. So it really just depends on the requirements of each particular event. How crucial is the live music in your budget? If you’re stretching the budget a lot by having live music at all, then trio of course costs less and still sounds great – and will enable you to create the kind of atmosphere that only live music can provide. If budget is very limited you may even be considering a solo instrument. Just remember though that solo musicians tend to charge more as it’s more difficult and specialised than playing in part of a group. Therefore, sometimes you can get more value from a duo or trio for a little extra as it’s by far an easier engagement for the musicians than playing on their own. So to summarise, overall we know that string quartet sounds better than string trio in almost all situations. But of course, string trio has its own charm, is slightly more intimate and may be more suited to particular events and smaller venues. In any case, the best thing is to talk to us directly about your event, as we can then advise accordingly. We’ll never try to pressure you into choosing one over the other, but rather give you all the options, our expert opinion and then let you decide. It’s your event so you should have the music that you want!